Update: After some speculation, it has now been confirmed that Sony and Panasonic are teaming-up to bring down the price of OLED TVs. The two companies plan to make the screens together and go into mass production in 2013. The two rival Japanese companies will pool their research and development resources in order to mass produce the next-gen screens and make them more affordable for consumers. The companies have lost ground in the race to get living-room sized OLED screens to market, with LG and Samsung both set to launch their stunning 55-inch displays in the coming months. However, at £6,400 (over $10,000) for the LG set, it's difficult to imagine the 4mm-thin screens ending up in the home of your average consumer. Sony and Panasonic's deal seeks to change that, by undercutting the Korean pair and making an OLED purchase a more viable option. Sony is currently working on a spray solution, that would fabricate screens, while Panasonic is experimenting with inkjet printer technology. 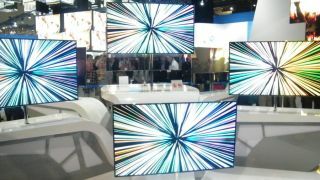 LG recently said a mass market for OLED televisions was years away. Let's hope the Japanese pair can find a way to change that because we're fed up of seeing and not owning these beautiful displays.